Irish Water has published a report summarising feedback from the latest consultation on the Water Supply Project, Eastern and Midlands Region where the utility asked for views on its identification of the preferred scheme for a new water supply for the region and on the proposed environmental methodology for the Project Environmental Impact Assessment. The Project will deliver a secure, reliable and sustainable long-term water supply that will be critical to support the eastern and midlands region’s social and economic growth from 2025. It will be the first major comprehensive upgrade to Ireland’s new water source infrastructure in the region in over 60 years. The Project will involve the abstraction of water from the lower River Shannon at Parteen Basin in Co. Tipperary, with water treatment nearby at Birdhill. 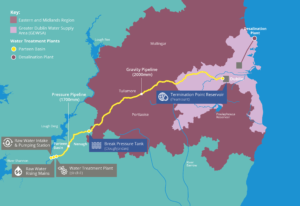 Treated water would then be piped 170km to a termination point reservoir at Peamount in County Dublin, connecting into the Greater Dublin network. Communities in North Tipperary, Offaly, Laois, Westmeath, Kildare, Meath and Wicklow will also benefit from the project with possible future off-shoots from the pipe that will enable the development of extra homes and businesses and increase the potential for inward investment. Apart from the Greater Dublin Area (GDA), the most urgent areas with impending water deficits in the region are the Mullingar supply area of Westmeath and the rapidly expanding area of east Meath bordering the GDA. As part of this latest Public Consultation, Irish Water held 8 public open days along the route of the pipe; had two briefing days for Oireachtas members and 5 councillor briefings; held over fifty briefings with stakeholder groups; had 6 landowner information evenings for the 500 landowners along the route; and sought responses from the public through 36 advertisements in regional and national media, press releases and social media. The review of the project, its alignment with the National Planning Framework and analysis of all of the feedback has confirmed definitively that existing water supply sources do not have the capacity or resilience to meet future requirements of homes and businesses in Dublin and the midlands. Forecast population and economic growth will generate a demand for an additional 330 million litres of water per day by 2050 to give both the GDA and the midlands regions the resilience and reliability of service that is essential to inspire public confidence and continue to attract economic opportunity. Irish Water has updated the project documentation to reflect all relevant new data available since the original Project Need Report was published in March 2015. This takes full account of the Census 2016 data, National Planning Framework, the forthcoming draft Irish Water National Water Resources Plan, and the recently published River Basin Management Plan. Speaking about the need for the project in the light of a number of submissions, Sean Laffey said.